The African Development Bank President Akinwumi Adesina (file photo). 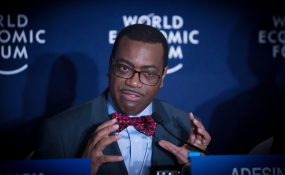 THE African Development Bank (AfDB) President, Dr Akinumwi Adesina, said in Dar es Salaam yesterday that it was looking forward to investing a total of 1.5bn US dollar in various sectors in the country over the next two years. Dr Adesina was speaking shortly after landing at Julius Nyerere International Airport (JNIA) on the invitation of President John Magufuli. He was received by the Minister for Finance and Planning, Dr Philip Mpango. "We are proud of the good relationship among us; Tanzania is among the leading beneficiaries of soft loans from AfDB," he said. Dr Adesina added that the bank had invested 3.6bn US dollar in Tanzania since 1971. According to the AfDB boss, the ongoing projects in the country through AfDB funding were worth 2bn US dollars. we expect the improved roads to ease transportation and movement of the people and thus stimulate economic development and industrial growth in the country," he said. He said Tanzania had improved in supplying and connecting electricity to its people in various parts of the country. He said so far 38 per cent of wananchi accessed electricity services. According to Dr Adesina, AfDB was planning to ensure that 82 per cent of Tanzanians were connected to electricity. On his part, Dr Mpango said AfDB had been supporting the country in various areas. He said Tanzania was looking forward to cementing the good relationship with the bank for future development.